With more and more products and stores to choose from every day, shoppers are becoming increasingly selective about where they spend their money. As a result, they require more and more information to help them make their final purchasing decisions. For a huge 77% of shoppers, product reviews are the main source of validation before buying online. Without touching, feeling or trying out the product, the commentary from others becomes an incredibly valuable part of the decision making process. Considering how many customers take the time to read reviews online, they’re clearly something that shouldn’t be ignored. That’s why we’re excited to announce our new integration with Loox – the photo review platform proven to increase sales. By using the power of Loox and LoyaltyLion together, you’ll be able to reward your customers for leaving eye-catching photo reviews so customers can see your products in action. So how can you make the most of this partnership? Reviews act as a perfect source of user-generated content. According to research, 88% of customers trust online reviews written by other consumers as much as they trust recommendations from their personal contacts. And, when photos from the reviewers are attached, the level of trust skyrockets. These photos act as a credible source of proof beyond the standard commercial and sales images. They know it comes from other customers and shoppers who are just like them and who are using the product day to day. This means that they’ll feel more confident that they’re making the right decision to shop with you. With Loox, customers can leave visual reviews that are displayed in review galleries. These actively boost credibility, trust, conversions and sales. And, with 73% of customers saying that the content within a review is more valuable to them than the overall star rating, making the most of this visual content is clearly vital to your overall success. Members of your loyalty program are more likely to act as advocates. So, use your loyalty points and rewards to incentivise members to leave visual reviews with the Loox integration. 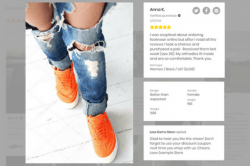 Notify your customers of the benefits they could be getting from photo reviews on-site and in post-purchase emails so they are inspired to take action. We’ve said it before and we’ll say it again, it costs five times more to acquire a new customer than it does to retain one and it’s these existing customers who generate the most profit. They already know and trust your brand as they’ve purchased from your before, meaning they’re more likely to come back. In fact, once a customer joins your loyalty program and uses a reward, the chance of them purchasing again jumps to 68%. By integrating LoyaltyLion and Loox together, you can use your loyalty emails and product recommendations to incentivise customers to return to your site and leave striking photo reviews. And, by gifting your happy customers points for this action, you’re giving them a valid excuse to return to your store – and hopefully bag another item that catches their eye. Want to find out how LoyaltyLion and Loox can work together to elevate your store? Find out more, or book a demo with a member of our team today.